Thirty years on, (although there was a 10 year break in the middle) we now use three or four chords – sometimes more – and like to think we’ve improved in various other ways, but basically it’s still the same band. Stardom is still just round the corner, but meanwhile we’re plugging away playing mostly original stuff with somewhat odd arrangements. I like to call it “latin-jazz-rock-reggae-psychedelic-enka-punk” but who cares? 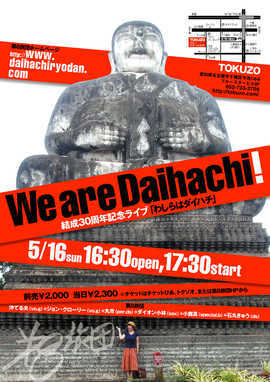 If you’re in Nagoya on Sunday 16th May, come and check us out at Tokuzo! Last week there was no farm report because the band went to Kyoto for a gig. We left early but didn’t hit the traffic jams expected on a 1000yen highway Sunday and arrived with several hours in hand, so walked around a bit. I don’t need to tell you about all Kyoto’s fantastically beautiful temples and shrines, but most of the town itself is somewhat unremarkable; the central shopping streets could be anywhere in Japan – not a patch on Paris, for example. The joke runs that while the Americans refrained from obliterating Kyoto in the war, the Japanese did the job for them afterwards. The “live house” where we played, Taku Taku, is a really nice place in a big old wooden building with beautiful warm accoustics. (They do have noise problems though, being right in the middle of a residential area, so it all has to stop at 9:00 on the dot.) Our previous gig there was nearly 30 (yes thirty) years ago! It took them that long to get over it, but finally we were allowed to play again, and this time it went OK I think. During the intervening period they seem to have had some quite famous people playing, so I really wondered what we were doing there, but the audience were great. Sometimes it seems as if Daihachi Ryodan might be more suited to Kansai than Nagoya! An Indian guy, now based in the US, comes into Raffles’ sometimes (he likes Malaysian food), and the other day when he was here I put on some old Bollywood music, thinking he might enjoy the nostalgia. “EEH – didn’t expect to be hearing this sh*t here in Japan! !” was the sort of reaction I got. Hmm… I guess that music has quite different resonances for us. For me, apart from enjoying the technical level and imaginative arrangements, those sounds are redolent of the India I visited some 30 years ago before coming to Japan. Even earlier, some of you might remember the head shops of the 60s/70s with their burning incense, Indian god posters and Indian music in the background. India was cool in those days – and still is, for me at least. Last week we went back to Osaka for another Daihachi Ryodan gig. The last time was the Haru Ichiban festival in a beautiful Spring park, but this one was at a funky place called Rain Dogs in the Umeda “entertainment district” – a zone of cheap eating and drinking places, interspersed with various disreputable-looking establishments offering some kind of “service”… Very much an Asian city scene packed with neon signs, strolling customers, hustlers,sounds, smells… and much bigger than any equivalent in Nagoya. Osaka is big – with 6 million people, and then Kobe and Kyoto close by, this is an urban conglomeration to rival Tokyo/Yokohama.The Osaka expressway is quite something – this maze of overhead highways snakes to and fro between high-rise buildings just like something out of the comics that were around when I was a kid. The difference between that view of the future and the reality it’s turned out to be is that the people in those pictures looked happy and relaxed as their futuristic vehicles flew here and there – now everyone’s late for a meeting or something and stressed out. Why do we have to spend so much of our time going from one place to another these days? Topping the bill at Rain Dogs was Noboru Abe and the Magic Animals (I wish I’d thought of that name!) who were really good, in an odd sort of way. No spectacular solos or anything, but an original groove and interesting vocals. One of those bands that creates their own world. I suppose they’re a sort of cult band – they don’t even have a web page. Abe san is a dai sempai who in 1998 was hanging out with Mickey Hart when I was just starting College, and one of the moving spirits behind the Haruichiban festival. Kansai (Osaka, Kobe, Kyoto and district) is kindof cool these days and you can hear kansai ben on NHK where before it was all standard Japanese, a bit like the increase in regional English on the BBC. Osaka is sometimes compared with Birmingham in the UK, but the people remind me more of Londoners – quick talkers, great sense of humour (Osaka’s the centre of manzai ), on the lookout for a quick profit but friendly and kind. They make good audiences too, and Daihachi’s performance went over quite well I think. A nice outing. Listening this morning to “Weekend Sunshine” I got all nostalgic listening to early Pink Floyd, grooved on Malians Rokia Traore and Issa Bagayogo… finished off with Herbie Hancock and Joni Mitchell… If you live in Japan and don’t know this NHK FM radio programme you’re in for a treat. Check out this week’s playlist. Of course the DJ Peter Barakan is a fellow UK citizen, about my age and arrived in Japan about the same time, so I suppose it’s not so odd there’s some musical affinity, but when I discovered this programme two or three years ago Japan was a better place to live. Saturday morning 7:15 to 9:00 is not a time I’m usually too active, so I use our video recorder to record it. They have built-in timers, usually hi-fi sound these days (in fact these days everyone except us has got a dvd recorder) and you just have to connect an fm tuner to a “line in” socket at the back somewhere. (I’m sure the same would work with a dvd recorder.) Anyway there’s a good quality sound recording on the video cassette and I can copy stuff I like onto an audio cassette (yes we’re pretty retro round here) or maybe some day I’ll figure out how to get it into the computer as an mp3 file or something. Anyway, it’s great music. With online stores and illicit downloads from the web radio programmes might seem a bit outdated but I still think there’s a place for a DJ who can turn you on to things you might not have found otherwise. I’ve discovered so many excellent musicians thanks to Peter Barakan’s show. Keep up the good work! While on the subject, another NHK FM programme I like is Masakazu Kitanaka’s World Music Time. A bit variable, but sometimes you get a great collection of sounds from some country you knew little about.